For other places with the same name, see Rudawa. 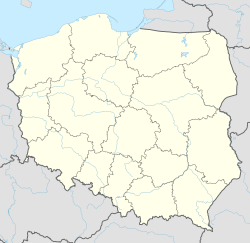 Rudawa [ruˈdava] is a village in the administrative district of Gmina Głuchołazy, within Nysa County, Opole Voivodeship, in south-western Poland, close to the Czech border. It lies approximately 5 kilometres (3 mi) north of Głuchołazy, 14 km (9 mi) south of Nysa, and 53 km (33 mi) south-west of the regional capital Opole. Before 1945 the area was part of Germany (see Territorial changes of Poland after World War II). During the Second World War, when known as Rothfest, the village was the location of a working party (numbered E42) of British prisoners of war under the administration of the nearby Stalag VIIIB/344 prisoner of war camp at Lamsdorf (now Lambinowice). This Nysa County article is a stub. You can help Wikipedia by expanding it. This page was last edited on 18 July 2017, at 23:38 (UTC).